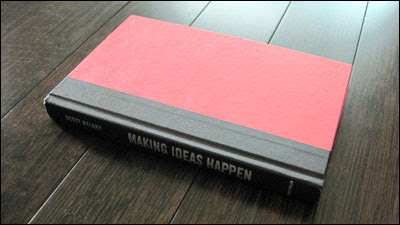 Like previously reviewed books, looks just as good without the jacket. 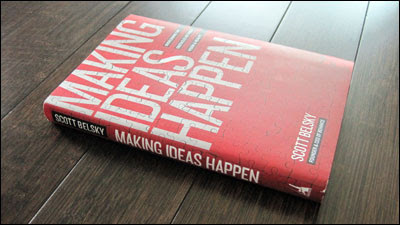 Following our review of Seth Godin’s book “What Matters Now”, my colleague Joe Giovenco and I turned our attention to “Making Ideas Happen: Overcoming the Obstacles Between Vision and Reality” by Scott Belsky. He is the Founder and CEO of Behance, whose mission is to “organize the creative world.” Sounds like a tall goal, but the company strives to do so through its organizational framework Action Method, which is applied to its products, mainly the Action Book. 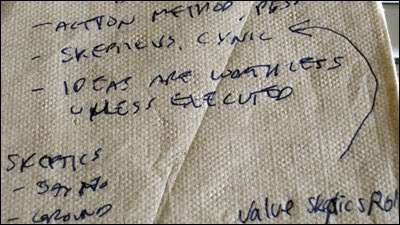 This time, a quick outline of talking points were jotted down. Big thanks to Nick Owen and Amanda Pritzker of Portfolio for the speedy delivery of a review copy. And big thanks again to Joe for collaborating on the review and for lending his recording tools and space. Related: Read Marketing Strategist Seijen Takamura’s use of Behance’s Action Book. In the June 2010 issue of Fast Company magazine, Scott Belsky is part of “The 100 Most Creative People in Business”.